Another day, another new feature/algorithm/scandal; as a marketer or business owner, trying to keep up with the fast-paced world of social media can feel overwhelming. To help you stay ahead of the curve, we crowdsourced ideas and advice from our quuumunity at our most recent Twitter chat. Q1 How do you stay up to date with industry news? Q2 When does a trend become a trend? Now we know where to get our news, how do we identify passing fads from major, industry-wide trends? Essentially, if your mum knows about it, it’s a thing. Q3 How do you go about testing and implementing new trends in your social strategy? Let’s say a particular trend has caught your attention and you think it could work for your business. Where do you start? Q4 Is following a trend necessarily the right social strategy for a business? Q5 What do you think has been the biggest social media trend of 2018 so far? Since we’re over halfway through 2018 already (terrifying), we thought it would be nice to reflect on the trends that have dominated our social feeds over the past few months. Q6 What do you think will be the biggest social media trend in the next year? Good sources for industry news: Twitter, Twitter chats, Facebook groups, blogs, influencers, newsletters, podcasts, alerts, Sip, Feedly, webinars, offline events, Reddit, Slack groups. A trend is a trend if even your mum knows about it. When implementing a trend in your social strategy, you need to test, measure and repeat. The ideal testing period is 3 months. Don’t be afraid to experiment with new trends, but think carefully about how they will benefit your business and, crucially, whether they are relevant to your target audience. The biggest trends of 2018 so far: video content (particularly Instagram Stories and IGTV — although many of us are still watching from the sidelines to see how brands use the latter), entertainment based ads, paid promotion and influencer marketing. Our predictions for the next biggest trends: micro-influencers, automation/AI, bots, voice search and personalisation. Want to tell us your answers to these questions? 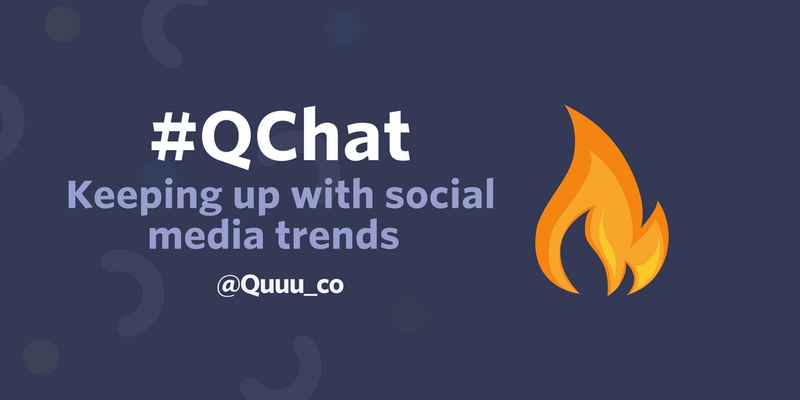 Reply to this story or tweet us @quuu_co using #Qchat. Quuu offers scheduling and hand-curated content suggestions for social media, giving you more time for other areas of your business.